"300 Rupees per day for the Suzuki 4 speed or an automatic" said the diminutive oil covered man at the motorcycle stand as he puffed a fragrant bidi cigarette. I preferred the 4 speed Suzuki on most days. 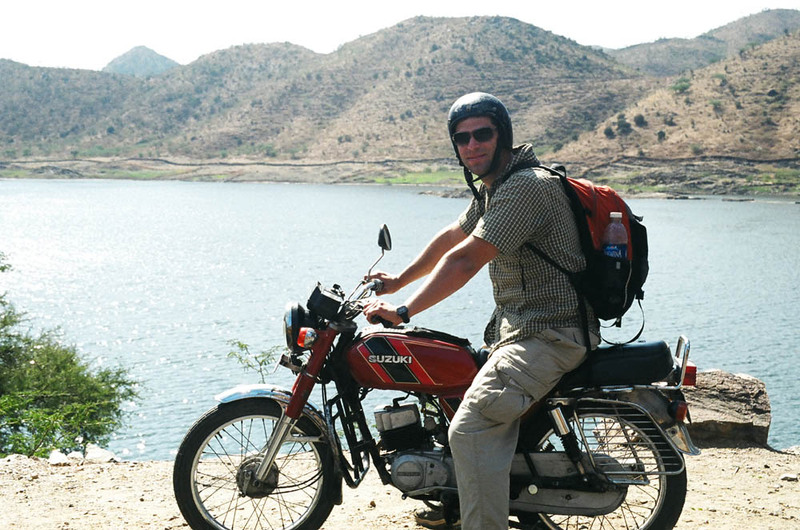 And thus parting with the equivalent of $6 per day I set off to cruise around Rajasthan by motorcycle. This would prove to be no small challenge as the city streets were thoroughly congested with dilapidated rickshaws, jumbled masses of people, and that most peculiar of Indian phenomena the "cow jam" (this time honored institution was at times worse than the sluggish traffic jams). It took a while to get used to driving on the left side of the road and the fact that the Suzuki had a cantankerous clutch, popping out of gear every time I hit one of the cavernous potholes made things a little interesting. The city of Udaipur is a breathtaking sort of fairly tale land. The extravagant palaces and weathered edifices of the main city envelop a small lake, in the middle of which a brilliantly white centuries old lake palace sits on a small island. Amongst the charmingly decadent ramshackle buildings wild alleyways twist and wind up and down small hills as Hindu temples spire high above. The ubiquitous aroma of delectable curries, dhal, fresh nan and chipati linger in the air, a constant testament to the allure of Indian cuisine. I have always held a certain amount of fascination for the beaches of Goa. A top spot on the "hippie trail" in the 60s the former Portuguese colony on the southern Indian coast sits perched on the mellow waters of the Arabian Sea. The Beatles meditated here in the sixties. I had set out to find the best beach in Indian and the state of Goa is a large place, so as is almost invariably the case the best advice on where to go is usually from fellow travelers. I met a expat Dutch artist in his 50's with long grey hair and a Dali-eske mustache who recommended I head to the beach villages of Baga and Anjuna. Baga is the quintessential backpackers paradise where palm lined sandy beaches stretch endlessly with the occasional hidden cove and rocky sea side cliff thrown in for good measure. Backpackers make the pilgrimage to Goa where they sip cold lassies and seek their own brand of enlightenment on the Indian sub continent. The Anjuna beach awakens at night with large bonfires and "Goa trance" blaring until sunrise on the otherwise desolate beach. Having been to an ample number of so called "developing countries" in the course of my global wonderings, I suppose I would consider myself to be somewhat well versed in the ways of travel. Yet with all the thirdest of words Ive been to, nothing I've thus far experienced even begins to approximate the unadulterated wonders of Varanasi. The holy city of Varanasi lies on the west bank of the sacred waters of the Ganges River, drawing Hindu pilgrims from the furthest reaches of India. Perhaps it would be convenient to throw around terms like spiritual, surreal, bizarre, mystical , exotic et cetera, however attempting to convey an appropriate characterization of Varanasi in mere words is no small transgression of accurate description. I have the strongest of suspicions that Varanasi is much more accurately experienced than read about. 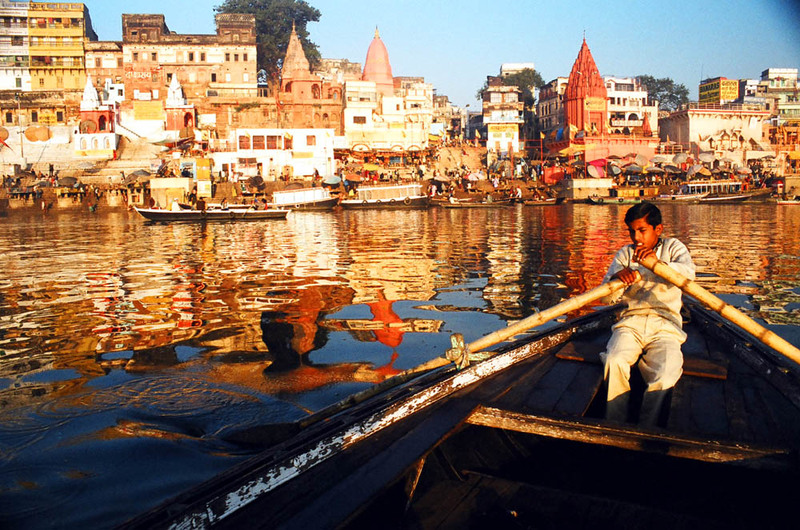 Varanasi stands as the most sacred of cities in Hinduism. The 100 or so ghats in Varanasi stand as architectural monstrosities. A ghat is best described as a massive series of steps that leads down to the waters fronting various building and temples set behind the steps. 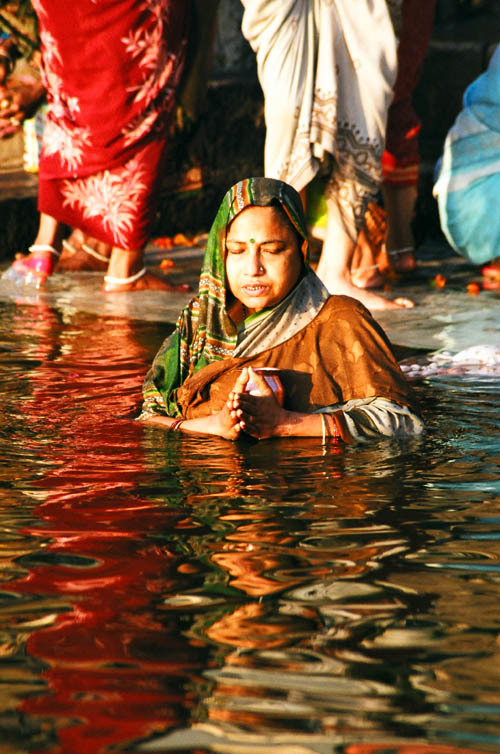 Warm amber hues of the morning sun kiss the cool waters of the Ganges as the faithful cascade down the steps into the water to pray and bathe. Aging women wade in the murky waters wearing brilliantly colored saris as the ripples distort the reflections into a dreamy mirror-like canvas. Along the steps of the ghats huge murals of Vishnu, Ganesh, Shiva and a host of other gods gleam with bright paints. Like a freshly disturbed ant pile the steps of the ghats are abuzz with activity. Spiritual gurus with long matted hair, wavy beards, and bright paint on wrinkled foreheads wonder in front of centuries old ashrams barefoot. Their bright orange robes seem to glisten as they seek to walk the path of wisdom through ambrosial wisps of incense that drift through the air. A host of other religions congregate here in harmony with the Hindus. Bengali Hari Krishnas with small patches of hair sprouting from shaved heads mill around ancient steps and Sikhs with huge colorful turbans file into Gurdwara temples. An Islamic mosque sits in the foggy distance on a large hill on top of one of the ghats. Sunset at the main Dasaswamedh ghat is quite the spectacle with throngs of monks shrouded by thick clouds of smoke and incense. They stand on large elevated platforms chanting to large crowds as the sun melts delicately into the horizon. Behind the scene the night river lights up when the faithful toss countless thousands of floating candles in small leaf-bowls into the obscure waters. The candles twinkle like a distant galaxy of stars floating almost interceptively slowly down the black night river. High above the platforms hundreds of bells hang from long wires, each bell is connected to a string and pulled with an almost trance like vigor by frenzied zealots below, the chaotic clanging of the bells en masse somehow seems to harmonize perfectly with the chanting monks below. Perhaps the most surreal part of Varanasi are the two "burning ghats", called Manikarnika and Harishchandra ghats. The dead are brought to Varanasi to be cremated. It is said that when a Hindu dies and is burned on the Ganges in Varanasi they achieve "Moksha". 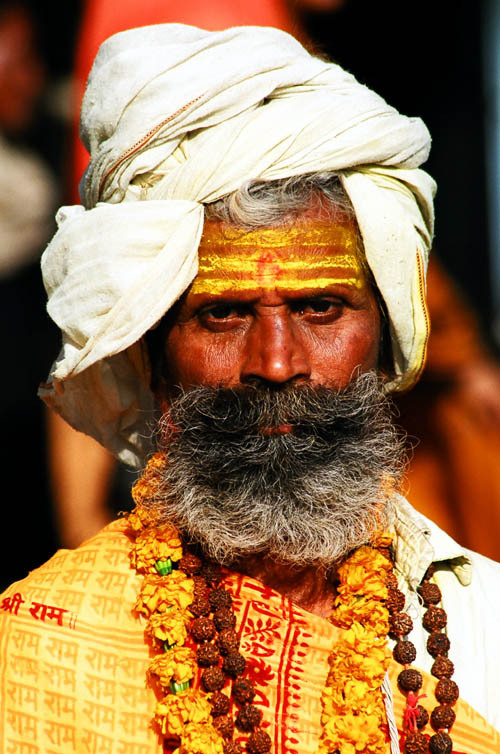 In Hinduism Moksha is liberation from the endless cycle of birth, death, and rebirth. The bodies are first dressed in brightly colored robes and brought to the bank on a wooden stretcher and dipped in the Ganges. The bodies are then hauled onto the ghat and laid on a stack of wood and a fire is started. At the end all that is left is ash and bone. The ash is then tossed into the waters. As I stood and observed I tried to imbibe the unreal scene. I looked around at the gurus, bodies, huge stacks of firewood, wild dogs and cows, and felt the heat of the fires radiate and the fumes distort the air. It seemed that this was the essence of Varanasi. At one point I noticed a rather scraggly dog waging his tail just to the left of my foot chewing on a blackened but still slightly white object. I peered down and upon further inspection of the object in the dogs mouth I realized it was the remnant of a human spine (I guess having taken human anatomy in med school has its occasional semi-practical applications), unfazed I thought to myself..... crazy only in India. The Taj Majal has been called the greatest monument ever built for love. It was built in the late 17th century by a Mughal emperor as a mausoleum for his wife after she died in labor. The eerie luminance of the Taj Majal seems to come alive at dawn as the warm tones of the protean marble morph into different shades of yellow/pink/white with each passing minute of the early morning sun. Sparkling pools of clear water and ornamental gardens surround the palace buffering it from the busy city. Unlike many world monuments the Taj Majal actually feels bigger in person than it appears in pictures. My hostel was not far from the Taj Majal, maybe ½ mile, and it was with a wide grin I could hardly contain that I observed one of the quirkiest sunsets ever. I sat on the roof about 5 stories high peering forward at the Taj Majal rising high in the distance above the other building immediately surrounding my building. The rooftops were all at least a few stories high and flat on top. Each one seemed busy with its own scene like different panels from a comic strip. On one nearby rooftop children played impromptu games of cricket on a tiny court. Other children on rooftops flew small kites. Funniest were the hordes of marauding monkeys amusingly pillaging rooftop cloth lines. To witness an old woman hysterically yelling and waving her clenched fists in the air at a band of monkeys fleeing with a pilfered shirt is a type of humor in a category all its own. All around flocks of doves tossed and frolicked in the air in synchrony and music blared from the streets below. Eventually the crimson glow of the heavy sun disappeared below the western sky and the Taj Majal faded into the darkness. Another of Indias Jewels, Jaipur is also called the pink city. Each building in the old city is uniformly painted a faded pink giving the city its nickname. Lush temples and assorted gaudy castles overlook the city from surrounding hills. Camels and large elephants pull bulky carts hauling all manner of cargo in the busy streets. All in India is not so rosy though. I found the dichotomy of abject poverty coexisting in the shadows of the showy palaces peculiar. Entire families lead their existence on the dirty sidewalks. An all too often and terribly sad site is seeing the destitute both young and old literally covered with dirt begging for food and money and sleeping barefoot and without blankets in cold train stations. As far as I could tell India has little to offer in the way of social welfare and sights like these are common all though India. Those unfortunate poor depend on the charity of their fellow man. It should be said that Indians are a charitable people and I witnessed many gestures of kindness toward the poor but charity can only go so far I guess. Hopefully as India continues to progress economically fewer people will fall through the cracks. A hustle bustle capital city, it is divided into New Delhi where the capital sits and Old Delhi where uhh things are old. The city has a relatively more modern feel compared to the rest of India. Lively markets abound and colonial monuments seemingly exist around every corner. Musicians bang melotic beats on tabla drums as the sounds of the sitar drone from small music shops. Ah to be in India..